Publishers, specialist publishers and their editing teams, broadcasting corporations, international manufacturing companies, market & consumer research businesses and institutes: these are all groups with international audiences who put their trust in KERN's experience when they need cultural and linguistic sensitivity. The international KERN team possesses specialist knowledge of traditional media, which we integrate seamlessly into our work, helping to broadcast your content in a way that also makes use of modern media and the internet. Our technical expertise allows for quick and uncomplicated implementation. The team cooperates directly with your production teams and specialist departments, or with your advertising agencies and communications partners. 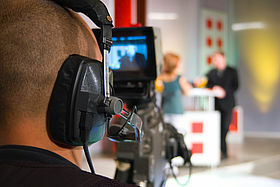 Media authorities are also business enterprises, and every business enterprise uses established media to broadcast their content on an international scale. This means it is both exported for a larger audience and used internally to inform, educate and explain processes to employees and teams. Clear, comprehensible and targeted correspondence is what keeps international companies running smoothly. An image that remains consistent across linguistic boundaries allows brands and products to stand out in the eyes of clients and business partners, but it is also part of a unified company culture that links individual branches across the globe. For all your PR needs, we provide experienced translators and editors who will translate press releases, press reviews and presentations into the language of your choosing. Qualified native speakers will support you in matters of internal correspondence, including the localisation of messages, employee publications and specialist articles for your international distributors or for your intranet setup. KERN interpreters strive towards absolute clarity when working at conferences, events and workshops, and give your international press conference testimonials real clout in the domestic market.